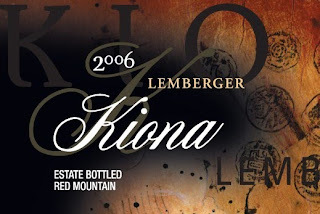 As I wrote in my recent Focus Report, Lemberger is a signature grape for Kiona Winery and Vineyards. Kiona was the first to commercially produce the variety in the U.S. back in 1980. The Williams family, who own and run the winery, have fourteen acres on Red Mountain planted to Lemberger. Vines range from ten to thirty years in age. Kiona sales manager JJ Williams states that people who try this wine either love it or don’t (I fall into the former category). Indeed, the grape is considerably different from say a Cabernet or Merlot that consumers are used to. However, this is a wine to expand the palate without breaking the budget. The Chateau Ste. Michelle 2006 Columbia Valley Syrah surprised me. Syrah in Washington comes in a variety of styles from big, rich, jammy wines full of fruit to meaty, earthy, funky wines full of earth and everything in between. For what I assume is a higher production wine (information not listed on the technical sheet), I was assuming the 2006 Columbia Valley Syrah would fall into the big and jammy category. My thinking here was that it’s a high production wine and there are endless acres of fruit getting a lot of heat in eastern Washington (Note: Had I checked when I bought it, the lower alcohol percentage might have tipped me off). While the taste is certainly rich and fruit-filled, the nose is much more meaty and floral than I was expecting. A very enjoyable entry-level wine in a style not frequently found in this price range. Brothers Butch and Jerry Milbrandt planted their first vineyard back in 1997. Thirteen years later, the Milbrandts’ vineyards encompass nearly 1,600 acres and thirteen distinct sites. For a number of years, the brothers were content to supply fruit to wineries throughout the state. However, in 2005, the Milbrandts began their own label - Milbrandt Vineyards. Gordon Hill, who previously worked at Chateau Ste Michelle, serves as winemaker. The back of each bottle of Milbrandt Vineyards wine bears the quote, "Individually we are just Butch and Jerry. But when we are working together we are like one really talented person.” The winery’s tasting room is located in Prosser. Hedges Family Estate is a family-run winery located in the Red Mountain AVA. Tom and Ann-Marie Hedges founded the winery in 1987. Peter Hedges, Tom’s brother, serves as winemaker and general manager. The 2008 CMS Red was February’s Virtual Tasting wine. Overall the wine made me wonder about the wisdom of releasing value wines so early. This wine, a 2008 that was released at least a month or so ago, seems disjointed and in a strange spot at the moment. It’s difficult to tell if it will improve over time, but it didn’t seem to be putting its best foot forward. No information on Distant Bay which has website with a splash page picture and nothing else. It brings me no joy to write about a wine I found so unenjoyable. However, my hope is that I have suffered so that you might not. Rating: + (Good) An aromatic wine with a nose loaded with red fruit, spice, and floral notes. A fair bit of alcohol shows at times. The taste is rich and fruit-filled with a potpourri of flowers and spice. A whole lot of wine for the money. 100% Estate Lemberger. Aged in French and American oak (25% new). 13.5% alcohol. 5,100 cases produced. Recommended. Rating: + (Good) Nose shows a lot of barrel aromas including mocha and toast, along with black cherry, other black fruit, and a whiff of green pepper. The taste shows a fair amount of bittersweet chocolate but is otherwise dry and restrained ramping up a bit toward the finish. The balance of fruit, tannins, and acid isn’t quite right but still a pleasing wine that offers a lot of value. 84% Cabernet Sauvignon, 10% Petit Verdot, 5% Merlot, and1% Malbec. Katherine Leone, Wahluke Slope, Northridge, and Don Talcott vineyards. 14.3% alcohol. 5,761cases produced. Rating: . (Decent) Berries, barrel notes, green notes, and a fair amount of Syrah aromas mark the nose (the latter seems strange as the wine is only 6% Syrah). After the initial pour the nose becomes muted. The taste starts off decently but then becomes tart and thins out, especially on the mid-palate. Overall, the nose and the palate don't seem connected. Perhaps will improve with time. 48% Merlot, 46% Cabernet, 6% Syrah. 13.5% alcohol. Rating: - (Flawed) A healthy whiff of Brett, maybe more than healthy, along with pine, black pepper, and smoke. An untoward bit of sweetness on the palate. Flabby without much of any structure to speak of. Sampled twice with consistent notes. 13.5% alcohol. Nice reviews on a few wines I have enjoyed. 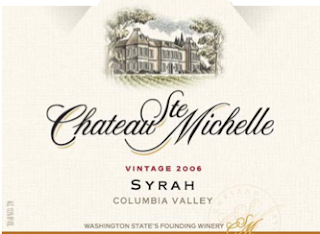 The Syrah by Ch.St.Michelle for the price is pretty decent. We've had a blind tasting and this bottle took home a bronze (re: last day of winter Olympics) over some heavier hitters. I lurked your virtual tasting of the CMS. Can't say I'm a fan. The CMS, not your virtual tastings. Lemberger by Kiona has been said to be the best by those who like Lemberger. I've only had Kiona's, so I can't say that. Just tried the Milbrandt over Valentine's Day. Came late in the day after several stops. I'll take your notes as gospel. Distant Bay? Sounds like I'll keep my distance. Happy last day of February! No surprise that Distant Bay wants to be known for their Monterey County (California) pinot noir and chardonnay. They probably bought bulk, leftover cab on the cheap just to make a quick buck. WAwineman, difficult to say if your assumption is correct given the lack of information out there about the winery. Stand behind the product or don't produce it I say. Oh, we liked Distant Bay cab. Set it up with other more expensive cabs, and it held up fairly well. Flabby? Nah. It's a good choice for a gathering for a lot of people to whom you don't want to serve "cheap" wine, but know that they also don't have discerning taste, or know that they are going to be drinking inexpensive wine. Anon, thanks for passing along that you liked the Distant Bay. Always interested in hearing people's opinions. Best wishes. Walla Walla can I purchase Cab. Distant Bay? I received a bottle as a gift and as a chilled red wine really enjoyed it. Please let me know where I can purchase more of it. Thank you. Anon 7:51p, Esquin in Seattle sells this wine and probably offers it through MadWine.com. If not, I'm sure if you call them they will hook you up.